9/28/17 Update: We still have this table in our living room and it has held up beautifully!! Who loves a good Pinterest DIY???? I know I do! Ever since we bought our new home, I have been dying to do some DIY's. My husband and I were in dire need of a coffee table for our little living room and most of the ones we liked were out of our budget. I don't start Law School for a few more weeks so I have some spare time for projects. So of course, I got on Pinterest and did some digging and discovered this great DIY project for a coffee table made of simple wooden crates. I looked at a few variations and decided on my own unique plan of attack. SO, without further ado, here is my tutorial for a DIY wooden crate coffee table. I wanted to find a good deal on the crates to keep our budget low. 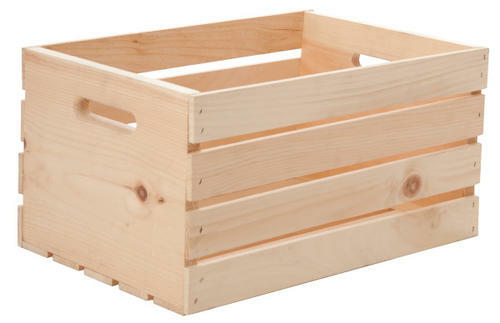 I had been looking for a few weeks and this Sunday paper showed the crates I wanted on sale at Menards for $8.99 with a $3 mail in rebate making them an all-time low price of $5.99. 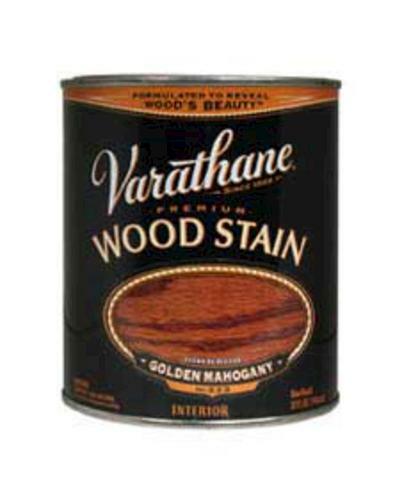 I went right out and bought 4 of the crates along with a small jar of stain ($7.59). 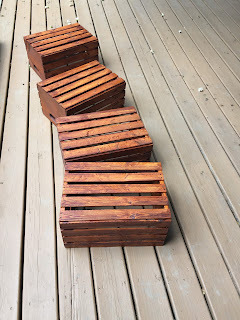 My next step was to sand the crates because they were slightly coarse and I didn't want any chances of splinters. An electric sander we already own made the job quick and easy. Staining came next. 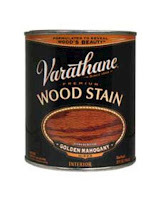 I did two coats of our chosen stain in Golden Mahogany. The first coat was brushed on and let dry overnight. The second coat was again brushed on and then I rubbed the excess off with an old rag for a nice rustic look. I let them dry after that for 4 hours. 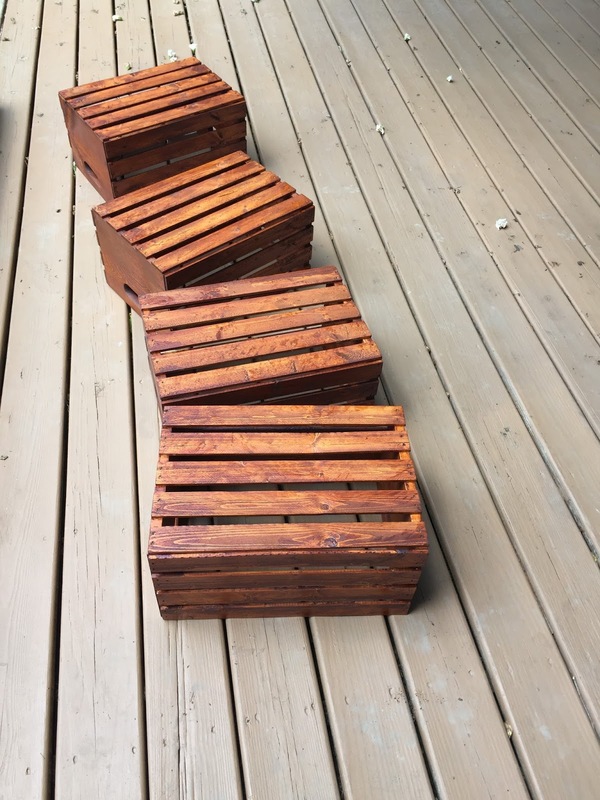 Once the crates were sufficiently dry, I arranged them into the size and shape I wanted. I made sure to put the best sides facing outward and got them nice and straight. After this, I put 2 screws in each junction. Be careful to screw into the strong wooden ends (with the carry holes) versus the rather flimsy slates. I put in a medium sized screw that went through both crates without poking out the other side. Now, I just placed my new coffee table in our living room and added some decorations. I chose to leave the center hole as is and put a tray over it. I think long-term we want to order a piece of custom cut glass to cover the whole top for durability but we haven't done this yet. Overall, I could not be more pleased with the project and the outcome! It completes our living room perfectly and was so simple. The color matches our other furniture, it has lovely storage and is just the right size for our small space. Eating in the living room is much easier now! The project in total took me about 3 hours. Sanding and staining took 2 hours and the shopping was about 30 minutes and putting it together took about 30 minutes. 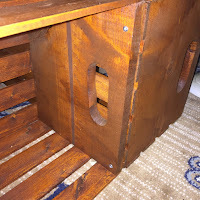 My total investment was $31.55- not bad for a coffee table and well within our budget! I highly suggest this project and I hope this tutorial helps you out! 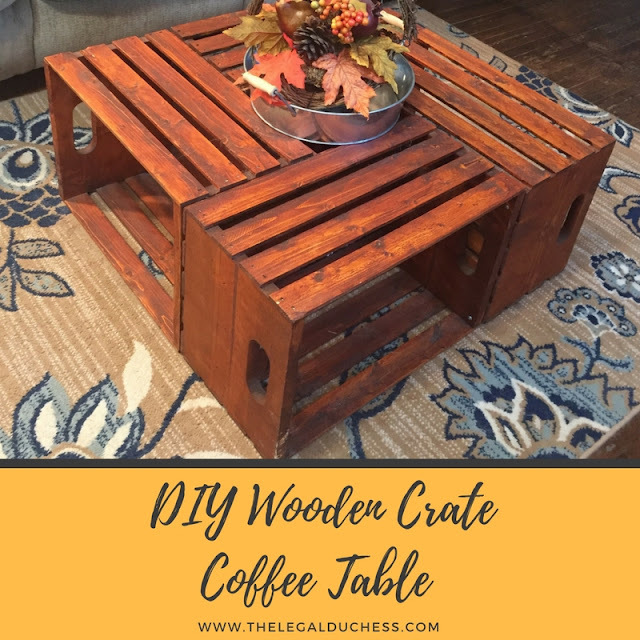 Check out this link for other great coffee table DIY's! 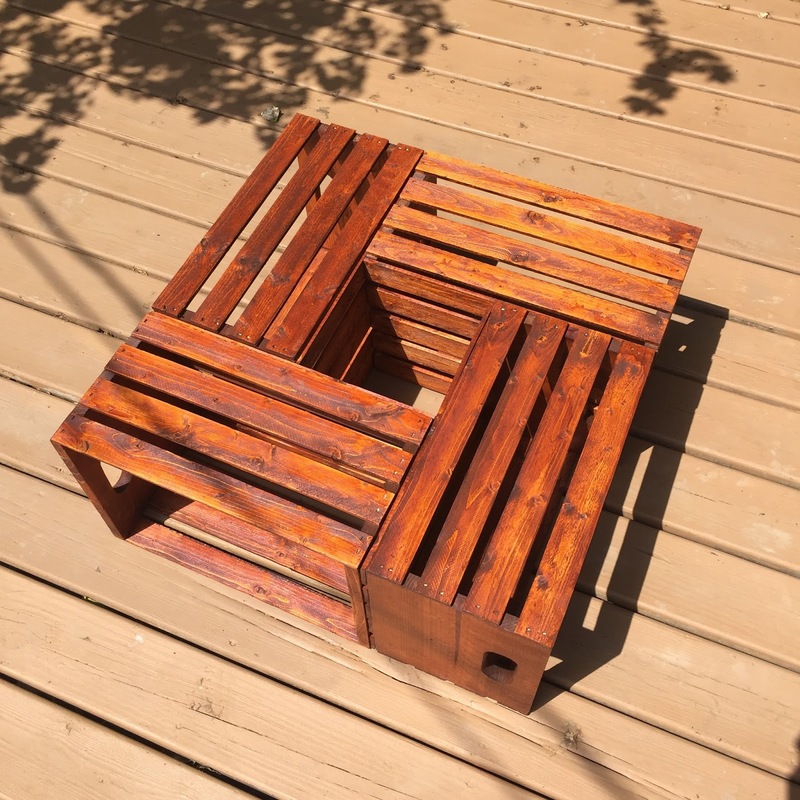 Admittedly it's probably not so great as far as actually functioning as a coffee table, what with the gaps between the slats of the grates and everything, but it looks amazing! And it cost hardly anything! I love it.